First real stop: the Adams National Historic Site in Quincy. 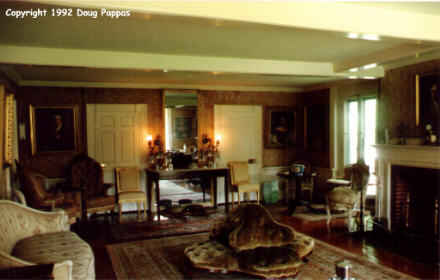 The house here was occupied by four generations of Adamses, from Presidents John and John Quincy through diplomat Charles Francis to writers Henry and Brooks. It began as small structure built in the 1730s and was acquired by the Adamses fifty years later, gradually expanding to four times its original size. The house remained in the family until 1927, when it became a museum, so all the furnishings are original to the family and many are quite historic. The real highlight, though, was the separate library building erected by Charles Francis circa 1870, devoted to housing the 14,000 volumes (in 12 languages!) accumulated by the family. Fortunately for my sanity after the Providence experience, Route 1 graciously joins forces with the major north-south interstate through Boston. I thought about stopping for the USS Constitution, but when I realized I'd have to double back 10 minutes through traffic to reach it, thought better of the idea. Instead my next stop was the Saugus Iron Works National Historic Site, which re-creates one of America's first factories, circa 1650. It was constructed during the 1950s by the American Iron and Steel Institute, then incorporated into the national parks system in 1969. The site includes a furnace, forge, and slitting mill along the Saugus River, with guided tours and demonstrations during the summer, along with a museum of 17th-century life. Visitors may also tour the Iron Works House, built in 1646 and furnished with period pieces.I learned a few things I hadn't known before, but there's a limit to how much industrial history I really want to know. 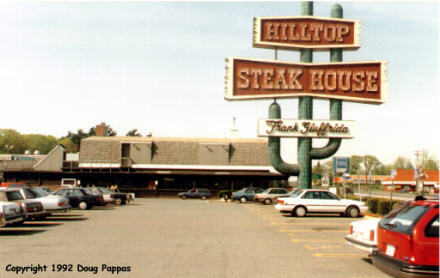 About two miles north of the Iron Works, it was Roadside Time again: the Hilltop Steak House, an immense restaurant (capacity about 1,400) which sometimes beats out large urban tourist-trap and expense-account restaurants as the country's highest-grossing eating place. The concrete saguaro towering above the commercial strip makes it impossible to miss. On a busy night, the line for a table can extend for 100 yards, but since I got there at about 4:00, there was no wait. Only one (450-seat!) dining room was open, and it was only half full. The drive through Portland loops around the bay for two miles, offering some actual scenery. North of Portland, Route 1 actually became almost rustic once again -- until Freeport, home of L.L. Bean and the spreading cancer of yuppie outlet stores which has infested the entire business district. Bean makes top-quality stuff, which I could actually tolerate before the store was elevated to godlike status in the Official Preppy Handbook, but Calvin Klein, Ralph Lauren, and especially Benetton should be blown off the face of the earth...preferably at 2 PM on a summer Saturday, when the stores are full of middle-aged WASPs in multicolored walking shorts. Spent the night in Brunswick, Maine, five miles north of the hubbub.